It's very satisfying to build something for which you've all the parts to hand, there's no waiting around, just immediate gratification. This little build is such a thing. 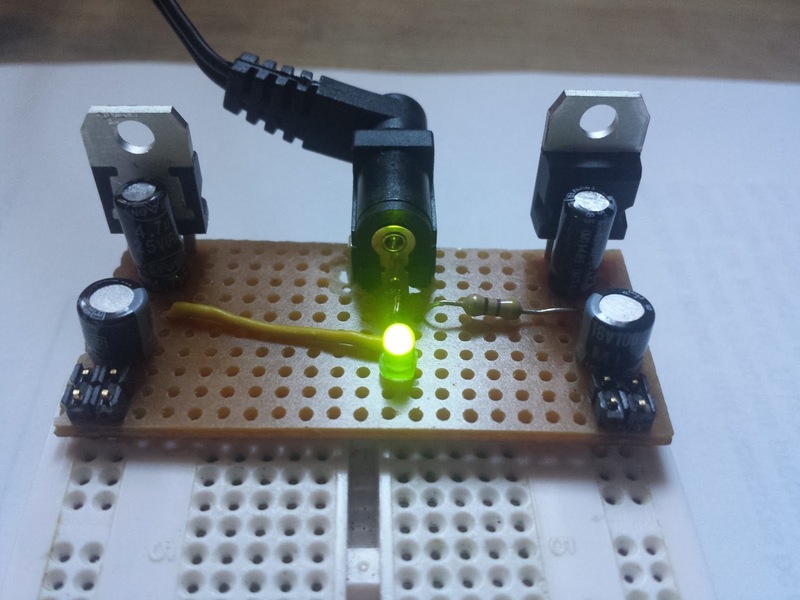 It's a dual-voltage (5v and 3.3v) power supply which plugs into a breadboard and is handy for projects which aren't powered from a USB tether (e.g., wireless microcontroller prototypes or projects which don't use a microcontroller at all, hard as that might be to believe). It's loosely based on the circuit below, although I used different values for the capacitors, having first done a bit of research to discover that the 100nF ones are used to filter high-frequency noise. If I have problems with that in the future I'll add them.